Kilbury forest which is the sanctum sanctorum of the biological diversity and a representative area for all such sites in the Himalayan region. It is an ecological paradise. Kilbury is one of those areas where oak and its associates are still thriving. It is a predominant species here. The beauty of Kilbury is the remarkable variation in the biological diversity with attitudinal variation. It has more than 80 species of trees, 17 species of animals and 27 species of birds. You will find nature in its abundance here. The misty hills, the sylvan surroundings, the towering Himalayas and the divine serenity weave magical spell. The camp offers accommodation in spacious safari tents. Transport to and from the camp, vegetarian meals, nature walks, mountain bicycling, horse riding, bird watching and jungle treks can be arranged on request. Non-vegetarian meals are served on order. At a height of 2194 mts. And only 16 kms to the North-West of Nainital on the Naini hill range running from East to West parallel to Himalaya, KMVN Camp Sigri, so close to bustling Nainital, yet safely ensconced in the startling solitude of the wilderness, attract holiday makers with its salubrious the Oak, Deodar and Pine trees. The area is full of Flora and fauna and is an ideal spot for a quiet and peaceful holiday. 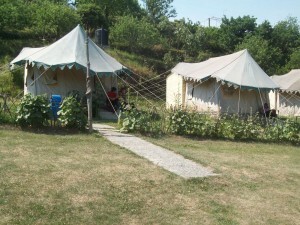 The camp offers accommodation in spacious safari tents. Transport to and from the camp, vegetarian meals, nature walks, mountain bicycling, horse riding, bird watching and jungle treks can be arranged on request. Non-vegetarian meals are served on order.. If you have not decided yet or wants to customize tour itinerary or hotels listed above in "2 Nights Camp Sigri Nainital Package by KMVN Rs.1200/-", then we can change the travel itinerary and make a personalized, tailor-made holiday package, especially for you. We can modify this travel package as per your itinerary, budget, duration and the tourist places you would like to visit, including transportation and airfare should be included or not. Please fill the form below to contact us.